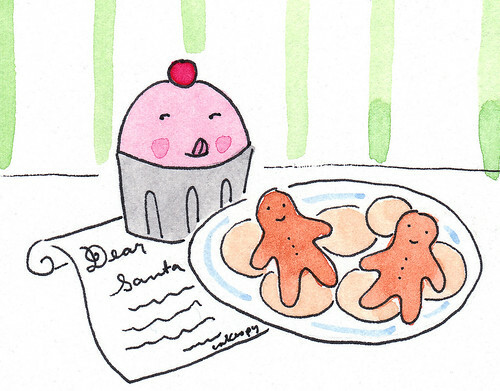 Christmas is rich in tradition--and equally rich in cookies (hooray!). But have you ever paused to wonder what the cookie selection might have been like for our ancestors? Well, in case you had been curious, here is a recipe from what is largely considered America's first cookbook (to clarify, the first cookbook featuring American food published in America--there had been other British books which had been released here previously), American Cookery by Amelia Simmons, which was published in 1796. If these cookies sound more like hockey pucks than delicious treats to you, please, don't despair--after all, as Amelia advises that "if put in an earthen pot, and dry cellar, or damp room, they will be finer, softer and better when six months old." Whew! "To three pound of flour, sprinkle a tea cup of fine powdered coriander seed, rub in one pound of butter, and one and a half pound sugar, dissolve one teaspoonful of pearlash (a rising agent) in a tea cup of milk, knead all together well, roll three quarters of an inch thick, and cut or stamp into shape and slice you please, bake slowly fifteen or twenty minutes; tho' hard and dry at first, if put in an earthen pot, and dry cellar, or damp room, they will be finer, softer and better when six months old."